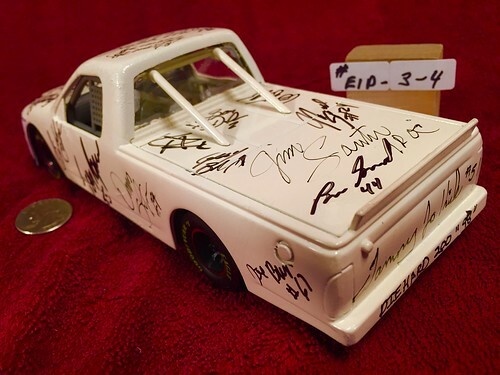 #E1D-3-4, NASCAR, The Late Buddy Baker, The Late Jim Sauter, The Late Tony Roper, and 22 other Truck Series Drivers signing, White Track Truck #4, 1998, Sears Diehard 200, at the Milwaukee Mile Speedway. Jack Spague was the Pole Setter. Mike Bliss was the WINNER of the Race. The Late, Barry Dodson was the winning Crew Chief. Ron Hornaday Jr., was the 1998 NASCAR Truck Champion. Greg Biffle was the 1998 NASCAR Truck Series Rookie of the year. 24) The Late Tony Roper, #55, Icehouse Beer, Tony died in a accident later that year. RACING CHAMPIONS, Stripped and Repainted, 1/24 scale, die cast, signed by 25 drivers with Picture Proof Photos, (P.P.P. ).